DEAL: B1G1 Free Smashburger Coupon – We are the LaVines. If you knew me, you’d know I love a deal.Everyone has to eat, right? Yes, you do have to eat.Why not eat something yummy?? 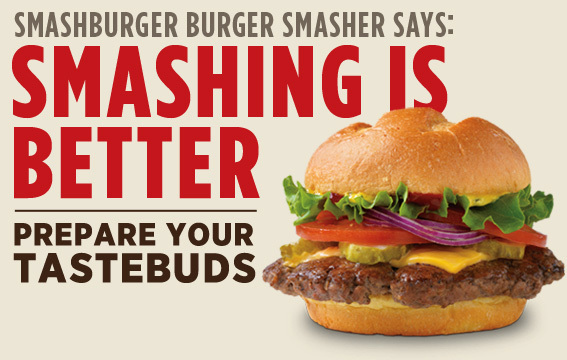 ?If you have one in your area, I’m sure you know Smashburger is pretty yummy. They have a coupon available right now after you “Challenge The Burger Smasher”.No, you don’t have to smash a specific amount of burgers, you just have to play the game.No, it’s not super exciting but the coupon afterwards is worth it. :)After you finish playing the game, you will see a button that says “GET THE DEAL”.Click it and a B1G1 coupon will pop up. Print & Enjoy your yummies. This entry was posted in coupon, deal. Bookmark the permalink. newest follower via the Blog Working Hop…OK, Smash Burger is my all-time favorite burger place! Their Chicago style hot dogs are amazing too…thanks for the info!